If we are going to convince our students that math is usual in everyday experiences, then we need to show them everyday experiences and have them do math. 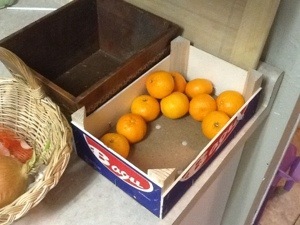 And a box of oranges like that is an everyday experience for me. In fact, that’s my kitchen in the picture. So, how many oranges will fit in that crate? And for a real challenge, how many will fit into the dark brown basket beside it? Remember, the power is in the explanation. Thanks for the comment and for telling me about your site. Realistic fiction in short story form about STEM is a pretty interesting idea. Especially since my school has mandatory literacy requirements for all students in all subjects, so if I find something that I want my students to use (or if you have any suggestions for a high school geometry class) then I will seek permission to show my kids. Thanks again and have a great 2013. Andrew, One of my stories that involves geometry (shape, distance, relative angles) is “Foot Notes.” It is based on a real experience I had developing an inexpensive foot shape scanner for an entrepreneur. If you are serious about using it in the classroom, I would like to offer my services to you as follows. I can put together a serious of questions or mentoring notes relating Geometry to the story “Foot Notes.” I am very interested in getting feedback regarding the use of my stories in the classroom. I have some Educational Scientists who are interested as well. If I write some mentoring questions for your geometry students, will you use them and give me feedback on the experience?